Brookvent, the Dunmurry-based manufacturer of innovative ventilation products, has secured the coveted title of Northern Ireland SME of the Year for 2017 at the UTV Business Eye Awards. The ceremony took place on Thursday the 7th of December at the Belfast Waterfront with over 700 business and community guests in attendance. The company, which exports its products as far a field as New Zealand, has experienced significant growth over an 18-month timeline and was shortlisted among 11 worthy competitors on the night. 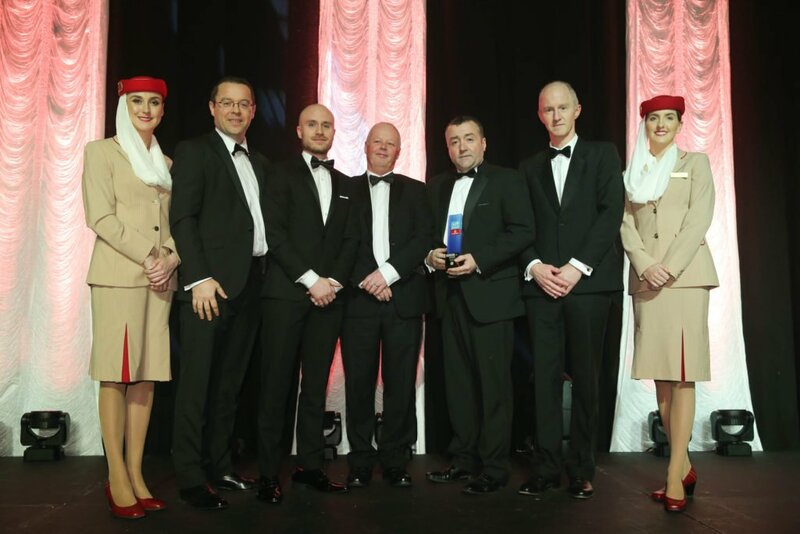 Declan Gormley, Brookvent Managing Director, said: “This award recognises the huge achievement by the entire team at Brookvent in delivering on our ambitious product development and export growth strategies. Prestigious projects in cities as diverse as Warsaw, Sydney & London have become a staple part of Brookvent’s portfolio, growing the brand and customer base across Europe and beyond. Brookvent also featured in the ‘Young Business Personality of the Year’ award category. Sales and Marketing Director, Dane Duffy (31), was highly commended on the night for his contributions to the award-winning company. Photo 1. Caption: Pictured at the UTV Business Eye Awards 2017 (Belfast Waterfront Hall) (Left to Right): Professor Mark Durkin (Executive Dean of Ulster University Business School), Dane Duffy (Sales and Marketing Director, Brookvent), Gary Toner (Operations Director, Brookvent), Declan Gormley (Managing Director, Brookvent), Michael Reid (Group Finance Director, Brookvent) – Also included are representatives from the award sponsors, Emirates.